i've noticed that my posts have been pretty sam-heavy lately. that's probably because not much of note has been going on that's not sam related. he's still changing daily. sucking his fingers, examining his feet, flipping onto his belly. i'm sort of missing his "little blob" stage. he was so tiny, swaddled in his blankets and tucked into his bouncy-seat. so cute, so new, so scary. but it's also so exciting to see all the new things he can do and all the things he's discovering. and of course, he's still so cute. last week was my last full week of work and i'm absolutely looking forward to enjoying more time soaking up all the adventures with sam. i feel like i've missed out while i was at work the last two and a half months, so i'm making a point of making sure that when the next two and a half months (and more) are gone, i won't feel that way again. flipping onto his belly? 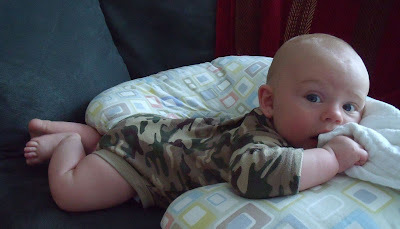 That makes tummy time almost automatic?